Their custom glassware may be clear, but SFU students Angela Wong and Nicole Ilagen are seeing life through rose-coloured glasses after their company, Thoughts On Glass, was declared the winner of SFU’s Next Top Product 2014. 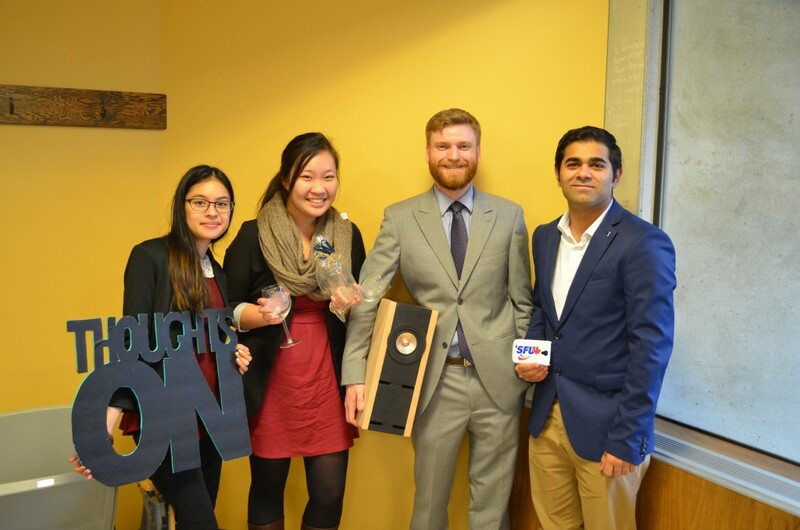 At the competition’s final presentation event held on October 30, the glass-etching duo beat out two other student entrepreneurial teams to earn themselves a $500 initial purchase order for their product from the SFU Bookstore. As “crafters that are inspired by your thoughts,” Thoughts On Glass works closely with customers to create one-of-a-kind stencils which they use to etch logos and wordmarks onto a variety of glassware, including mason jars and wine glasses. Begg, an executive with over 25 years of experience developing and commercializing software technologies and a representative from one of the event’s sponsors, Venture Connection, was joined on the judging panel by SFU Bookstore manager Mikhail Dzuba and half of last year’s winning team, SFU student Rachel Cheng. Each team was given five minutes to sell their product before they faced questions from the judges. Joining Wong and Ilagen in the finals were Koran Thukral, one third of the business team behind Make My Case, a company offering custom SFU-branded cell phone cases, and Eric Hedekar of Grey Rock Acoustic, who produces speakers which offer high fidelity sound. While Make My Case impressed with the saleability of their phone cases and Hedekar had the room bumping with a demonstration of his speakers, the judges announced after some deliberation that Thoughts On Glass was the winner. For Wong and Illagen, this journey has been several years in the making, beginning when the two were classmates in high school. Although they admitted that they’re aren’t sure how their product will fair at the bookstore, as they’ve never gone retail before, they were confident they could find an audience at SFU. As for the long term future, the pair see endless possibilities to where Thoughts On could take them. While there could only be one winner, the judges were impressed by all of the presenters and the competition in general. For Dzuba, the event was a huge success for all involved, and he is keen to see SFU’s Next Top Product continue in the future.